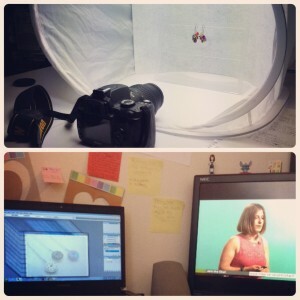 Shooting & editing jewelry photos while watching CreativeLive. Today I had a plan. I knew exactly what I was going to write about. It was going to be a response to a newsletter I received on Sunday. My brain was so wrapped up in the contents of the newsletter that it insisted on ignoring the fact it was my day off (despite me reminding it several times) and more or less wrote it in my head while I was showering. Today I was going to write it out and post it here. That plan changed when I turned into today’s CreativeLive class, Instagram Marketing for Small Business with Sue B. Zimmerman. I tuned in expecting it to be like most other classes, where I am happy to pop in and out depending on what I’m doing. However, I quickly recognized it as class I wanted to watch (or at least listen to) in full. In addition to sharing her own knowledge of Instagram, Sue interviewed multiple guests of all ages and business sizes/types. She shared a few impressive stats, including the engagement rates for businesses on Instagram vs. Facebook and Twitter (it’s crazy better!). She talked about ways to increase engagement. She emphasized focusing on educating, informing, and entertaining followers. She discussed the benefits of having a seperate featured, or business only, account instead of a combining business and personal. She shared a way to directly monetize Instagram using Paypal and Square invoice links. And so much more! I’ll miss a chunk of day 2 tomorrow due to my music theory final, but the good news is CreativeLive does an immediate replay after all their live broadcasts. As long as I’m up for staying up, of course. As far as I know, there’ll be no interruptions for day 3. I’ll have to rearrange my schoolwork plans this week to accommodate, but I think it will pay off in the long run. Literally. I highly suggest tuning in if you get the chance. If you’re curious, you can watch a 15 min clip from today on the class page. I do mention CreativeLive often, so for clarification purposes I want you to know that I share because I am a fan. All I’m getting out of it is the knowledge that their classes will help you too. So, what about the other thing I was going to write today? The new plan is to write it this Thursday. Also, keep a eye out for the launch of Fibropreneur.com on Instagram! In the meantime, we can connect through my combined Instagram account. Is your business on Instagram? If not, do you have a personal account? Leave an answer in the comments below or send me an email. Topic: Journal; Tags: business, class, CreativeLIVE, education, entrepreneur, Facebook, fibropreneur, Instagram, Instagram Marketing for Small Business, marketing, PayPal, school, small business, Square, Sue B. Zimmerman, Twitter, writing.